How good was our January 2016 trip back to the Patagonia Region of southern Chile? Well let’s put it this way, I wish I had stayed another month. January is summer in Patagonia and the weather there is a lot like Alaska in the summer. The temperatures ranged from lows in the mid forties to highs in the low seventies. But trust me, the wind blows so 6 & 7wt. rods are the norm. The beetle hatch was really on and the fish just love them. When the beetles are on the water the fish know that they are not going anywhere so they take their sweet time swimming up to the beetle and the take is really slow so you have to wait for the fish to take the fly and turn away before setting the hook. It is just really fun to watch! 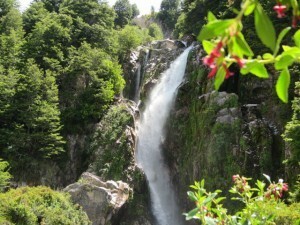 The photos above are from the upper Rio Paloma in the rain forest area where much of the water is from glacial runoff. 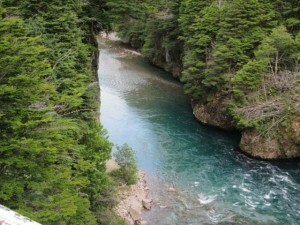 You can see the beautiful Rainbow Trout in the above photo had taken on that beautiful blue glacial coloring. I have never seen a Rainbow with such vivid blue coloring. We fished everything from the high rainforest rivers down to the spring creeks in the valley to the rivers running right to the edge of the Pacific Ocean. 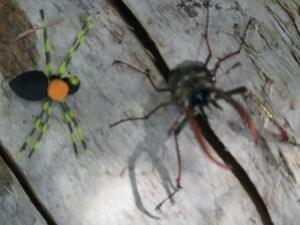 In the water of the rainforest it was mostly beetles and other terrestrials. In the valley spring creeks we fished a lot of small grasshopper patterns in #12 & 14 sizes as it was early summer. Many of the lower rivers had some fantastic Caddis hatches and #12 Adams to rising fish also worked well. Of course I fished a variety of streamer patterns on all the waters with excellent success. I never fished a nymph rig the entire trip so that in itself made for a wonderful trip. Both Cinco Rios Lodge (www.cincorios.com) and Estancia del Zorro (www.estanciadelzorro.com) are elegant, comfortable and the gourmet food is plentiful! All the Chilean guides: Lalo, J.D., Roberto, Rodrigo, Fernando and Hector all speak excellent English. 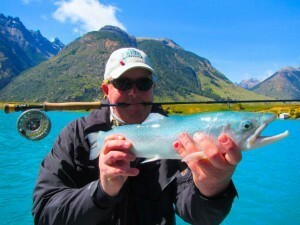 By the way, Hector is an excellent commercial fly tier so check out his Facebook Page at Family Flies Patagonia. All of these guides know the waters as well as the right fly patterns and they are top notch oarsmen; but above all they are very safety minded as you are fishing in very remote areas where it can take a long time to get medical attention in case of injury. Quite simply, it is just amazing fly fishing in one of the most beautiful locations on earth! But that is not all, after fishing we headed back north to the foothills of the Andes to a wonderful old world spa, Termas Jahuel Hotel & Spa, for several day of wine country tours and just plain relaxation. Our good friend, Scott Jones, of Chilean Special Journeys (www.chileanspecialjourneys.com) in Santiago, Chile, took care of all of the after fly fishing tour arrangements. Check out all these spa and winery tour photos as well in the Gallery Section of the website. Thanks to Sebastian Galilea our host at both Cinco Rios Lodge and Estancia del Zorro for making our Chilean adventure such a great success. We are already planning another visit for January 2018 and already have three confirmed clients, so if you are interested give us call. Finally, as always, a special thanks to Tom Hawthorne, The Ozark Angler, for being a great friend on so many wonderful fly fishing trips over many years.